Our Halloween Combo Milky Way Soap Mold features a cat on a jack-o-lantern, a wicket witch on her broom, and three bats. Get ready for Halloween with some spooky soaps! 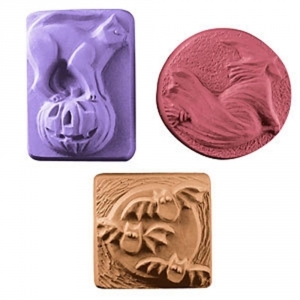 Cat: 3.25" x 2.25" x 1.25"
Bats: 2.5" x 2.5" x 1"
Notify me when Halloween Combo Soap Mold is in stock.